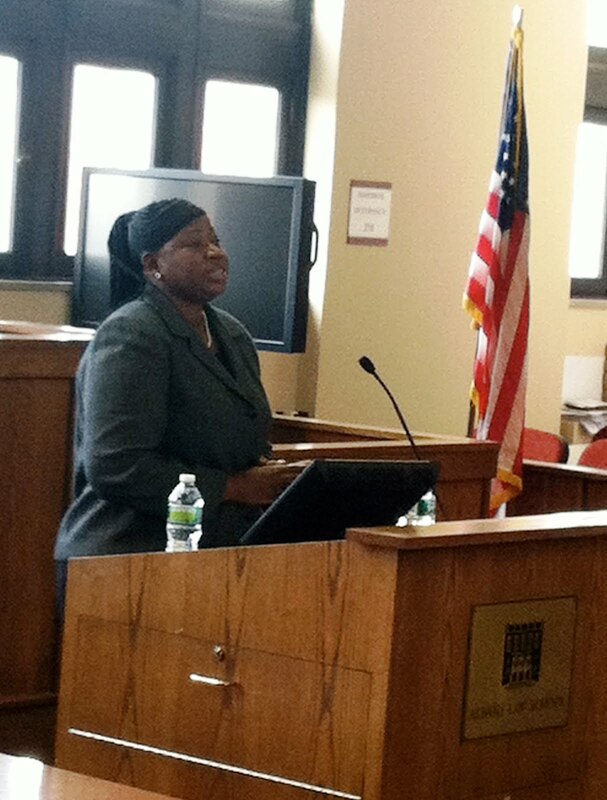 Last weekend, Albany Law School hosted Africa and International Law: Taking Stock and Moving Forward. The objective of this conference was to engage in a broad ranging conversation among scholars, practitioners and policy-makers to examine and evaluate how the international and regional regimes and institutions in Africa are producing new narratives of justice and how best they can make a real difference in responding to the challenges facing African peoples and governments. Previous incarnations of these forums have – to paraphrase language from the closing luncheon address – discussed Africans, discussed what Africans thought, and even told Africans what to think. 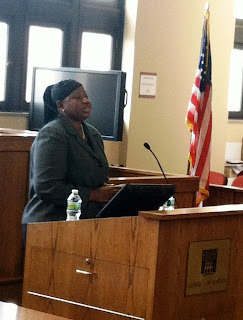 For this particular conference, however, Professor James T. Gathii, Associate Dean for Research and Scholarship and Governor George E. Pataki Professor of International Commercial Law at Albany Law School, invited an impressive array of African dignitaries, judges, scholars, professionals and experts. One such distinguished guest was Deputy Prosecutor and Prosecutor-Elect of the International Criminal Court, Fatou Bensouda (above left), who delivered the Justice Jackson Keynote Address. Bensouda listed evidence of positive African engagement with the Court and discounted any imputation of an African bias, based on the Court’s prosecutorial policy and procedure. She dismissed questions implying that politics affected the workings of the Court, including her election, stating that the Court is an apolitical body and her election was merit-based, as "you don’t just pick up an African and elect her," which elicited chuckles from the audience. She imparted the message that, with the Lubanga decision on the books, the Court was now "truly in motion" and impunity was not merely "an academic, abstract notion." After Friday’s breakfast, the blare of a vuvuzela called attendees to the keynote address given by Dr. Willy Mutunga, the Chief Justice and President of the Supreme Court of Kenya. Dr. Mutunga spoke with measured optimism of changes the 2010 Kenyan Constitution will bring and expressed his hope that the new Kenyan courts will become a source of "competent and indigenous jurisprudence." ► Dr. Makau Wa Matua, Dean, SUNY Distinguished Professor, and the Floyd H. and Hilda L. Hurst Faculty Scholar at University at Buffalo Law School, who pressed for greater African leverage within the international community. Friday and Saturday each consisted of two to three concurrent panels throughout the day, making it impossible to attend every one. Friday afternoon featured a student panel, moderated by IntLawGrrls contributor Alexandra Harrington, Visiting Assistant Professor at Albany Law School. I presented my paper, "Africa's 'Others': Pygmy Indigenous Rights," in which I discuss the legal challenges faced by a unique indigenous group with spiritual ties to the rainforest, who generally do not possess modern land rights and who may not even be regarded as indigenous, yet are often singled out for special discrimination. Other students presented on: "The Colonial Legacy and Modern Legal System in Cameroon"; "OHADA Law Reform: “Copy, Paste and Match Formatting” or Sui Generis Innovations? "; and "Rethinking Development Through Regional Integration Agreements in Southern African Countries." Student winners of the Albany Law School Justice Robert H. Jackson legacy writing competition also presented their papers: Daniel Levin,, "Has the Legacy of the Nuremberg Trials Under Justice Jackson Waned in Light of the Guantanamo Bay Terrorist Proceedings? ", and Melanie D. Sanders, "An International Prosecutor’s Legacy." Other panel topics included: Africa and International Law: Looking Back, Looking Forward; Adjudicating and Enforcing Regional Human Rights Law; Regional Trade and Development; Sovereignty, Popular Uprisings and Intervention; Regional Responses to Emerging Challenges; International Criminal Court in Africa; Africa and International Investment Law: Challenges and Prospects; Africa’s Contribution to International Law; Domestic Application of International Norms and Democratic Reform; and Transitional Justice, Reconciliation and Victim Centered Remedies. ► Whether the empowerment of African legal institutions, such as the African Court on Human and Peoples' Rights, will be perceived as obstructionist or complementary to international systems and institutions. Keynote addresses and papers presented may find their way into several issues of a soon-to-be published African law journal and possibly a book. Video of the keynote addresses will be available online here. It was a pleasure to attend and present at such a well-organized event, which was suffused with welcoming camaraderie and frank discussion.